Schools and universities have increasingly installed waste systems that enable waste separation at the source. 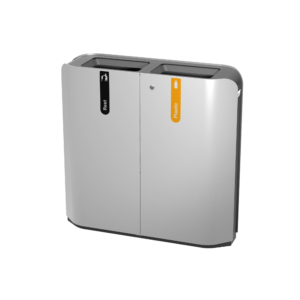 We separate paper, plastic, organic waste and residual waste. Transport companies transport thousands of passengers daily. With so many users, extra attention to waste collection and the prevention of littering is essential. Entrepreneurs in the catering & recreation sector have to deal with various waste streams. Paper, cardboard, glass, residual waste and organic waste. Separate waste collection at and around primary schools plays an important role. More and more people are using the parks and unfortunately also the litter in parks is increasing. Bammens is a Dutch company and is based in Maarssen. Development, production, installation and maintenance all take place under one roof. 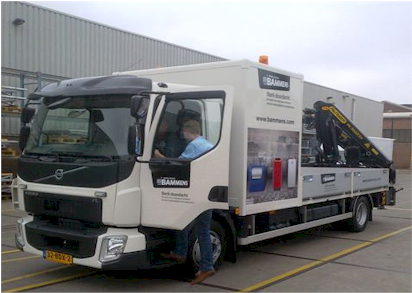 We are the market leader in the Benelux with solutions for aboveground and (semi-) subterranean waste collection. We export to nearly all countries in Europe. Royal Dutch Bammens, founded 1850, provides solutions for domestic waste, litter and company waste. 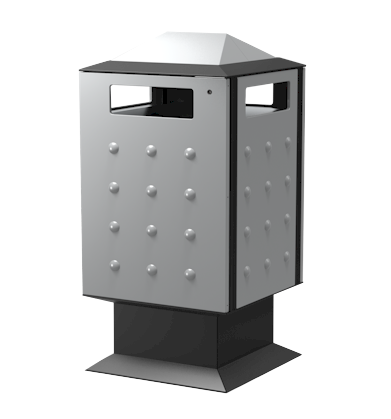 Our steel litter bins, wheelie bins and Collectors play an important, yet often unnoticed part in public areas and companies. Every Dutchman knows our products, often subconsciously. 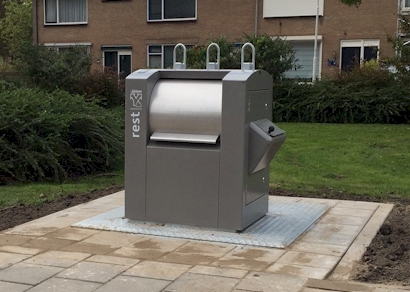 Our timeless Capitole litter bins are standard issue for Dutch streets, car parks and school playgrounds; our (semi) subterranean Collectors for residential areas, hotel and catering areas and shopping centres; and our famous galvanised wheelie bins at numerous companies and organisations. All products are both well-known and loved because they have been developed taking into account user-friendliness and collector as well as optimum safety and high durability. 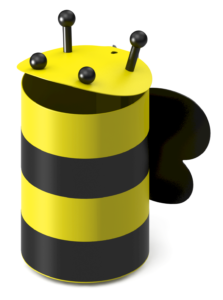 Information quickly retrievable and always related to the right underground container. In order to realize this, Koninklijke Bammens has developed a Container Management System (CMS). On 27 and 28 September, Bammens was present at the “Day of Public Space” fair at the Jaarbeurs in Utrecht. With plenty of attention for combating litter. The exhibition was especially for municipal officials and other professionals within the sectors: Green, Light, Paving, Underground, Street Furniture, Games, Advice & Management, Landscape Architecture & Design. Litter waste allowance for Dutch municipalities. 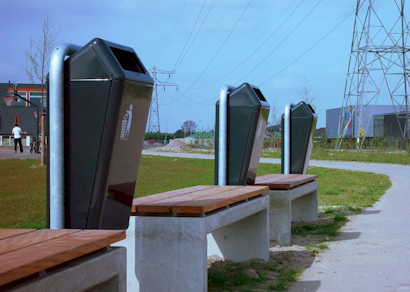 In order to promote the extra approach to litter, the Waste Fund provides municipalities with 20 million euros per year. Municipalities can claim the Litter payment by submitting an annual plan. Littering causes a lot of annoyance. Not only does it look unpleasant, it attracts vermin and cleaning up costs hundreds of millions of euros a year. Litter is bad for humans, animals and nature: it can pollute the soil and animals eat it or get entangled in it. Fish, mussels, shrimps and other sea creatures can store small particles of plastic in their bodies, so that it ends up in the food chain. 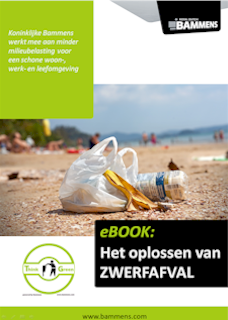 With this FREE eBook “Solving litter” we want to contribute to the fight against litter. We believe it can be more practical, cleaner and more sustainable and we work hard on it every day. With passion and attention we always think a step further. For the citizen, for the street, for the men and women of the cleaning service, for the city architect and the refuse collector. 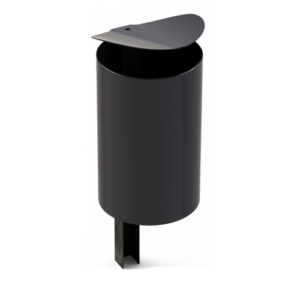 Combat litter with our litter bins: Sleek designs, vandal-proofing and various extra options. Available in many types and sizes. Robust and practical simplicity. 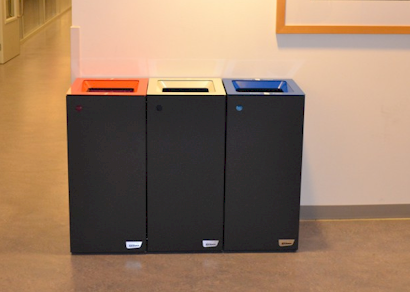 Fully customized and proven to be effective for the collection of waste in offices for many years. Containers with a large underground storage capacity. Only the modern-design insertion column is a part of the streetscape. We advise you beforehand, provide support upon placement and provide maintenance; Every container, waste bin and Collector deserves the best service and maintenance. Royal Bammens develops, produces, installs and maintains robust material collection solutions for household, industrial and litter waste for a cleaner, more beautiful and more responsible living, working and living environment. Royal Bammens is and remains a leading supplier of material collection solutions. We will continue to be visibly and committed to a clean living, working and living environment. Royal Dutch Bammens, founded 1850, is specialised in waste systems. We believe a more practical, cleaner and more durable approach is possible and work on this rigorously every day. We think one step ahead with passion and attention for the citizen, the street, the men and women of the sanitation service, the city architect and waste disposal. Our core values are: solidity, robustness, continuity, social, sustainability, innovation. These core values ​​are crucial to the development of our company, our products, our services and the relationships with our customers and stakeholders. Waste, as traditionally known, will no longer exist in the (near) future. Waste becomes raw material and that means that the collection and processing of waste changes dramatically. Waste collection and waste processing will therefore change in raw material collection and raw material processing in various ways. We want to play an active role in this growing awareness among government, companies and residents. The concept of waste is thus converted into making a positive contribution to a sustainable society. We will make it easier to collect waste as raw material and make logistics more efficient by developing and supplying appropriate products and services. Internet of Things will increasingly play a role. This connective information technology will be integrated in the entire chain, from collection to re-processing in end products. The acquisition of detailed insight into waste / raw material flows and the ability to respond alertly to situations and circumstances that may occur in this chain will be part of the development of solutions for data acquisition, data transport and data management systems at Royal Bammens. This development will take place in close cooperation with our users, customers and suppliers. Royal Bammens endorses the importance of a clean living, working and living environment. 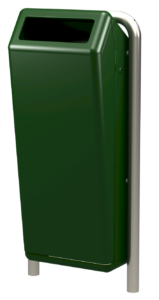 Think Green will be a theme for us, both externally and internally. This means we want to make the collection and transport of waste as efficient and effective as possible with our products and services. This should result in more litter, household waste and industrial waste entering the collection, transport and processing chain. This means less environmental impact and a higher raw material / waste ratio. Partnership is essential for Royal Bammens. We want to intensify collaboration with our customers and users, so we are better able to understand their wishes and needs as a source of inspiration for the development of products and services. We will intensify cooperation with our suppliers so we can be more effectively and efficiently in order to develop and produce products and services that are required. We do not exclude to we make choices about producing ourselves or having them produced for us. To be tested against our core values. We will enter into partnerships with partners, with which we can increase the added value for our customers and users. Over the past 80 years Royal Bammens has built its knowledge of waste collection and this knowledge is increasing on a daily basis. We will make every effort to share our knowledge, with the aim of contributing to a cleaner, more beautiful and more responsible living, working and living environment. To support this we will introduce a knowledge center and facilitate knowledge exchange.